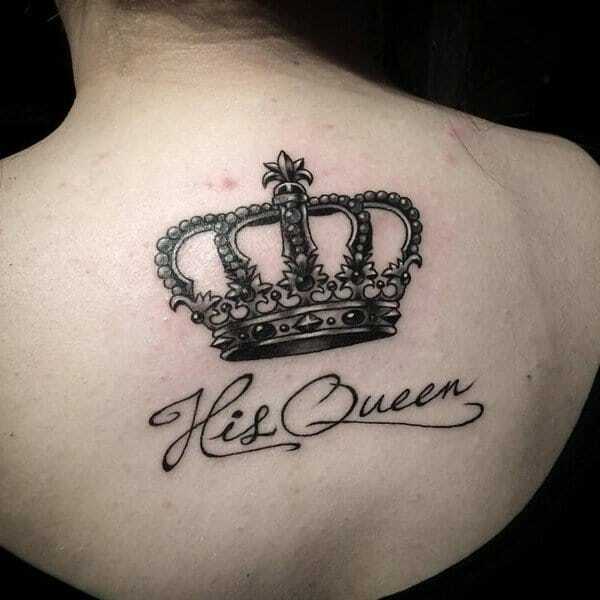 If you’ve always dreamt of being a king or queen, then a crown tattoo is the perfect choice for you! They are very symbolic and have a striking visual appearance. 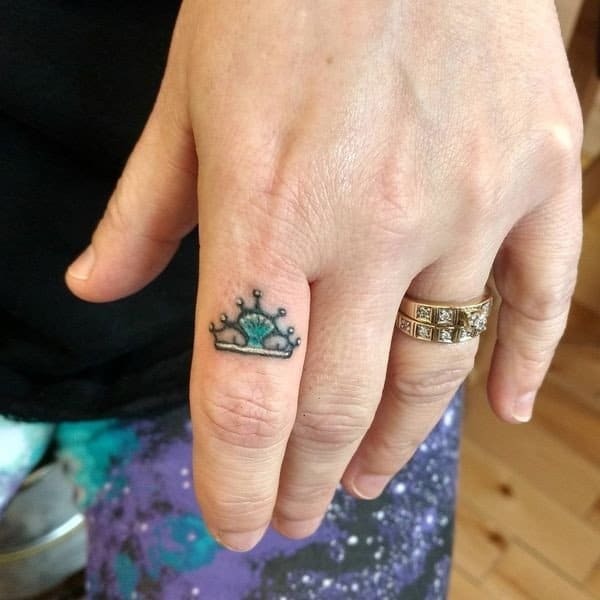 Small crown tattoos can be placed on the finger. 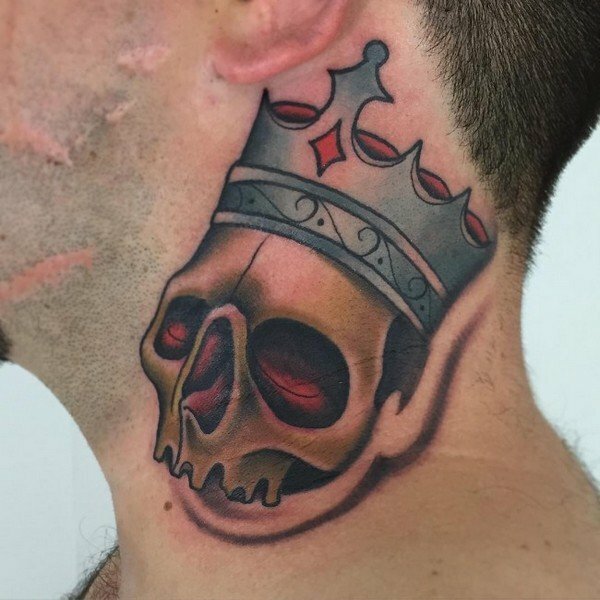 Crowns have been part of the tattoo world for many years. A crown is a symbol of a ruler, leading his or her empire and sovereignty. They are very emblematic, that is why it’s not surprising that they are used as a form of body art. A crown has always been used to represent royal power. They are a symbol of leadership and authority. 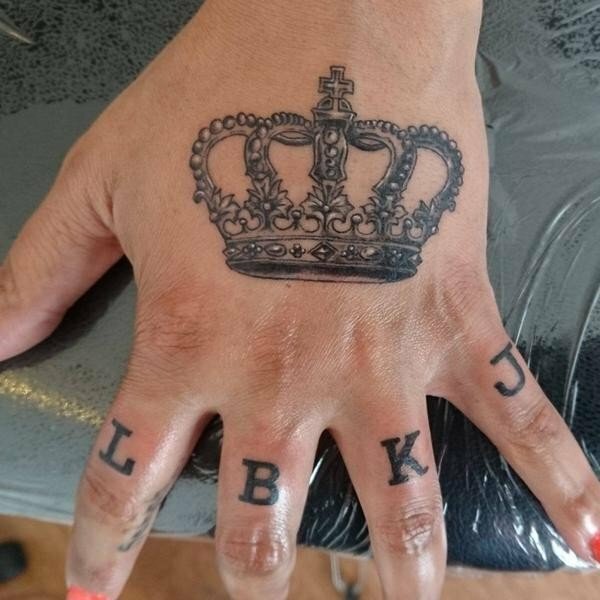 However, getting crown tattoos does not mean that you have the right to command other individuals. 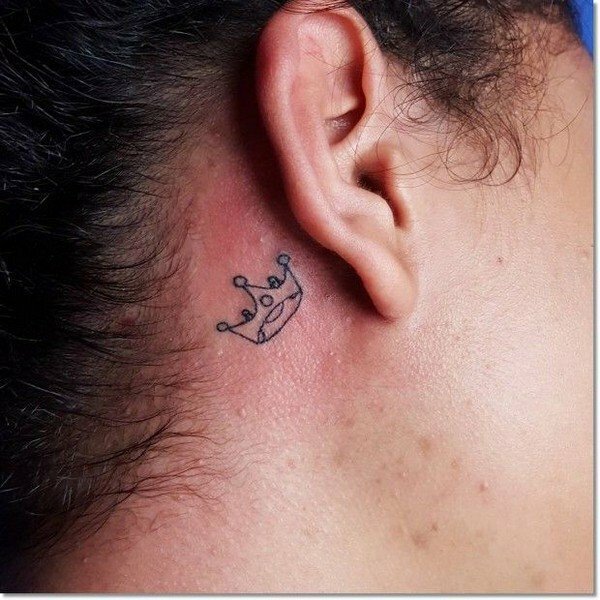 Crown tattoos indicate your capability to rule your own life, such as your ideas, emotions, and actions. 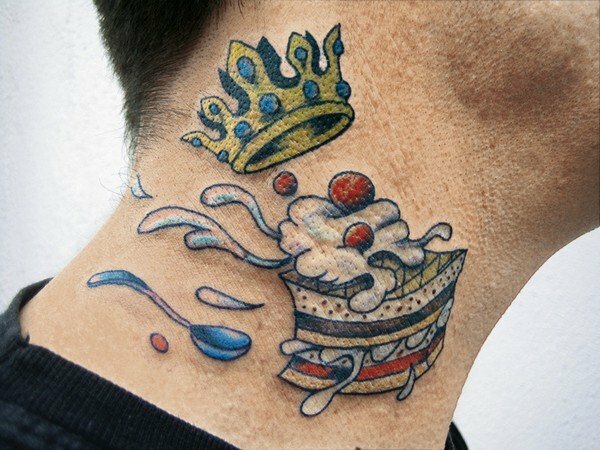 This tattoo may also signify your self-control and prompts you to use your authority rightfully, and, of course, smartly. Generally, crowns are usually worn by kings, queens, and other members of the royal family. This is the reason why it is commonly associated with royalty, dominance, and power. A crown represents the highest power in a kingdom. 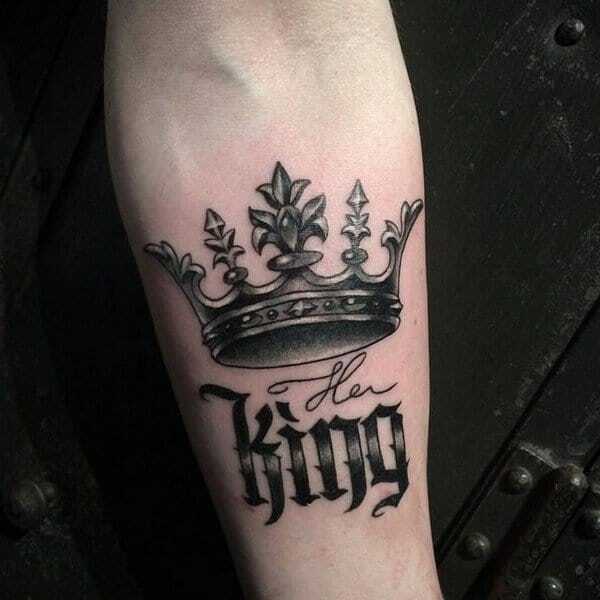 Consequently, crown tattoos signify the peak a person desires to reach in his life. However, wearing a crown is not only about power and pride, yet it carries responsibility too. Most often, people consider their king to be God-like. In fact, in some cultures, they depict their Gods wearing crowns. Crowns have religious implication as well. In the Christian world, Jesus Christ was forced to wear a crown of thorns during his crucifixion. 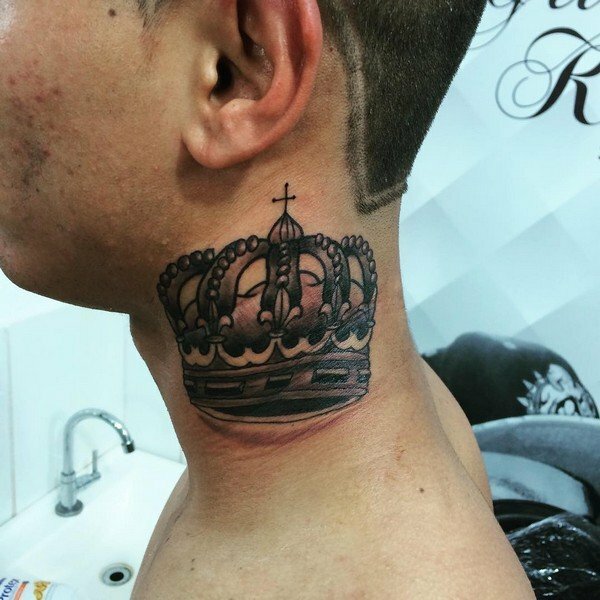 People who have solid faith in Christianity, find it relevant to wear crown tattoos to pay tribute to the sacrifice and eminence of Jesus Christ. Aside from religion, other people have personal reasons for bearing this tattoo. 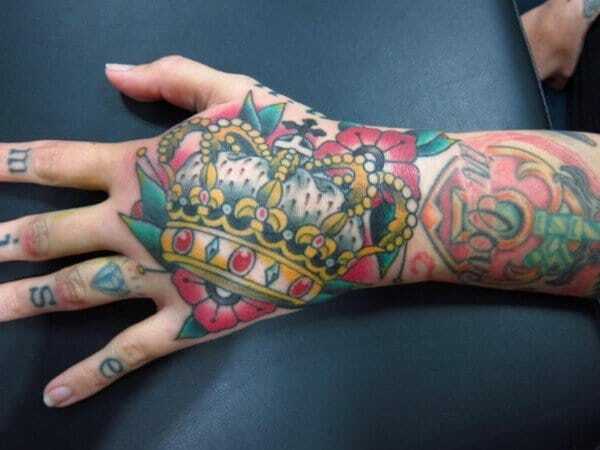 For instance, crown tattoos can represent their personal achievements. Crowns are also closely related to the zodiac sign Leo, which is symbolized by the lion, the king of the jungle. Since the lion is recognized as the greatest among all the animals, he has a close association with the crown. 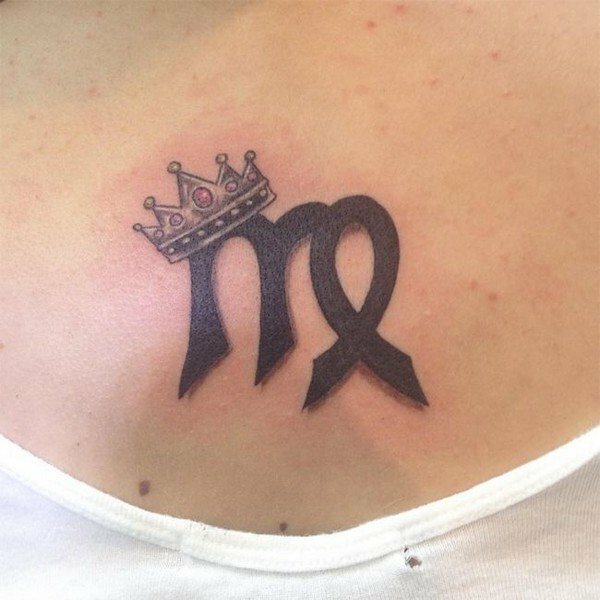 Most people who have this zodiac sign would favor getting a crown tattoo design. In ancient Greece, the champions of the Olympic Games and the greatest warriors were given crowns composed of laurel wreaths. It is a way of acknowledging their triumph, courage, and valor. In ancient history, the Egyptians assumed that the Pharaoh used the crown in connecting to God. The crown can also represent wealth and affluence since it is made of precious metals and richly embellished with gemstones. Some people believe the more jewels the ruler’s crown has, the more prosperous and powerful he was. The imperial crown in Europe is composed of eight golden arches which symbolized the eternal life and the circular rim exemplified eternal power. The crown image is also incorporated on the shields, coat of arms, and attire of the knights and counts. It represents their nobility and greatness. Crowns are also the epitome of true love and loyalty. This can be seen on the matching tattoos worn by couples and lovers. 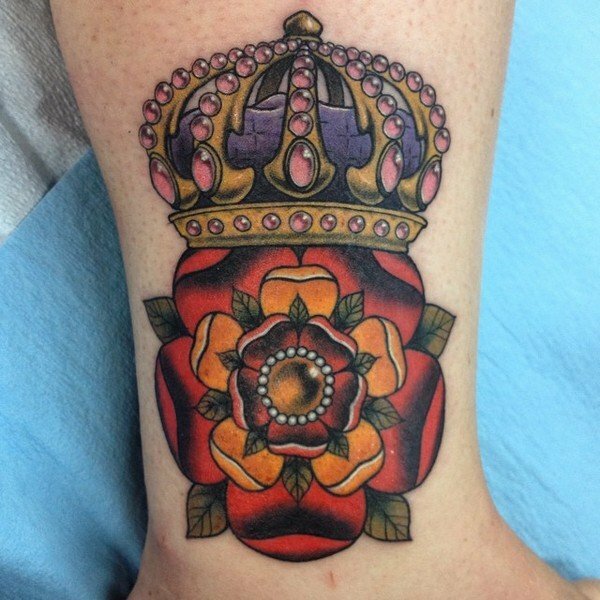 Get inspired by these amazing images of crown tattoos. In chess, the queen is very powerful since you can move in almost all directions. Just like in real life, our moms are our powerful queens. They help us in our journey through this crazy life. 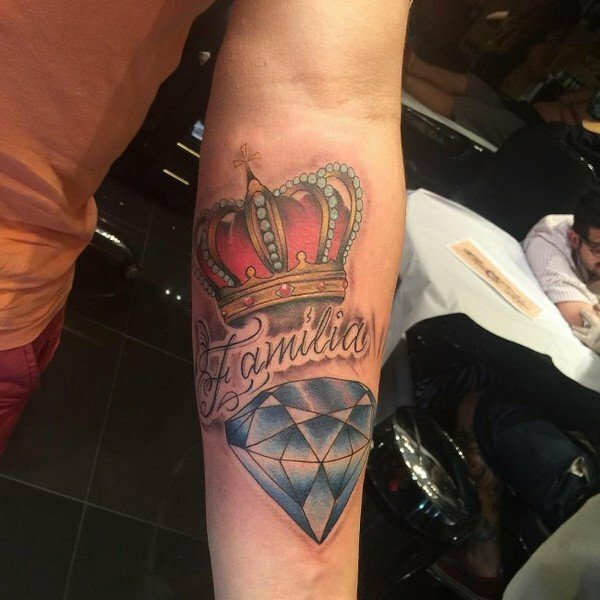 It’s not surprising that this wearer honors his mom with a royal crown tattoo. Most often crown tattoos are combined with other objects that represent wealth. In this piece, numerous diamonds of different sizes are gushing around the crown. Royal crowns are usually embellished with crystals, diamonds, and gemstones. Whenever you feel despair, just look down at your crown! 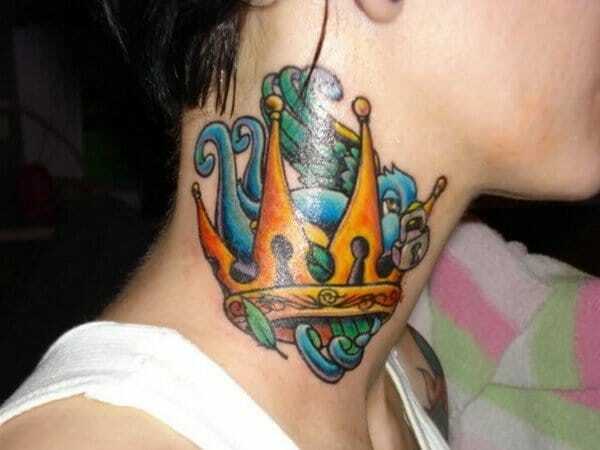 A colorful crown tattoo placed on the upper back of a lady. 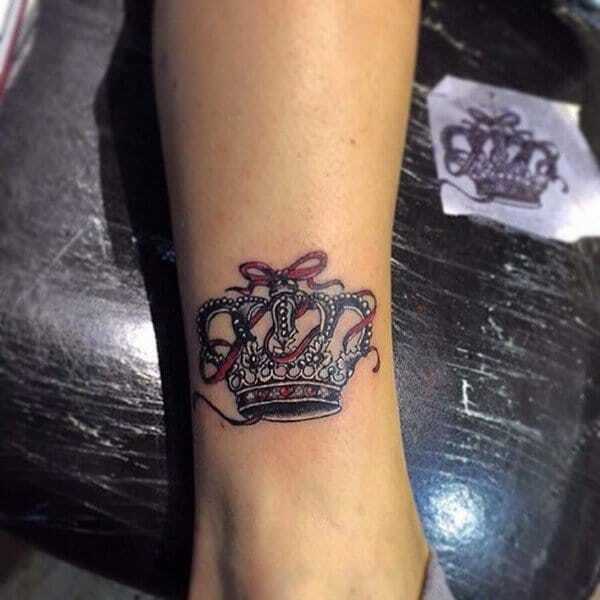 Crown tattoos are very popular and impressive due to their appeal and deep meaning. If you want to place your ink art in a spacious less visible area, then this is the right place. 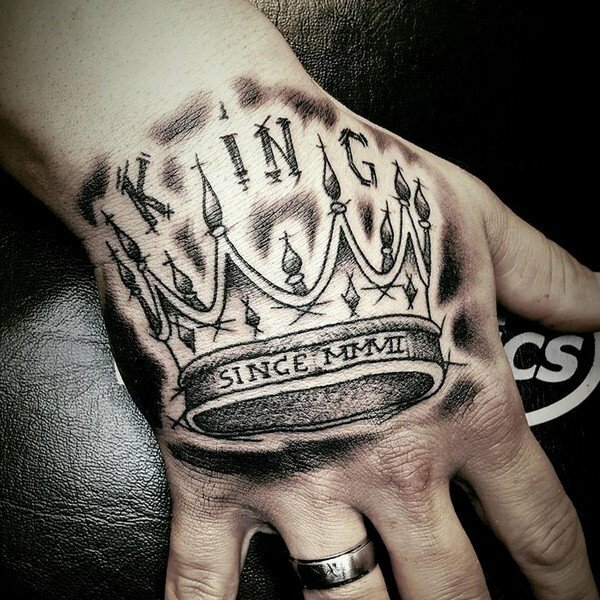 Crown tattoos can look cool when incorporated into other designs. 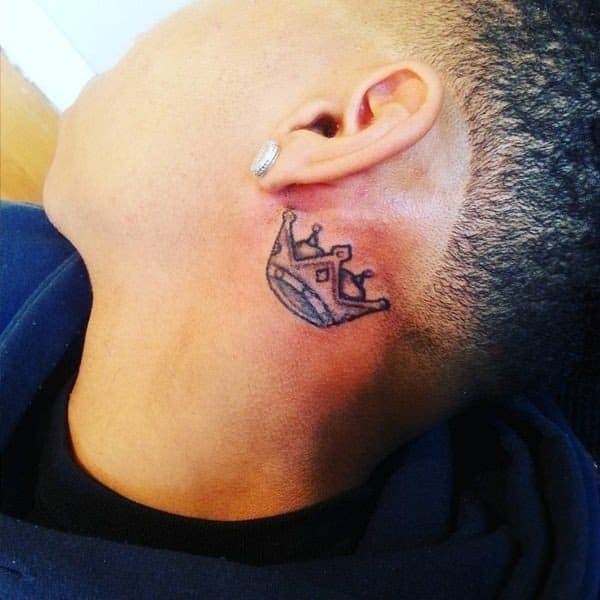 Whether its small or large, crown tattoos can express your aspirations. 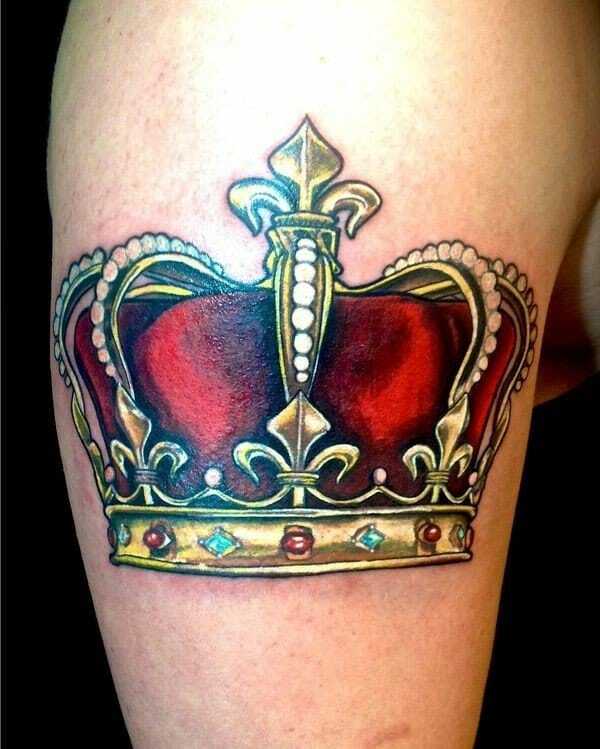 King Crown tattoos represent dominance, self-reliance, and good luck. Feeling like a king? 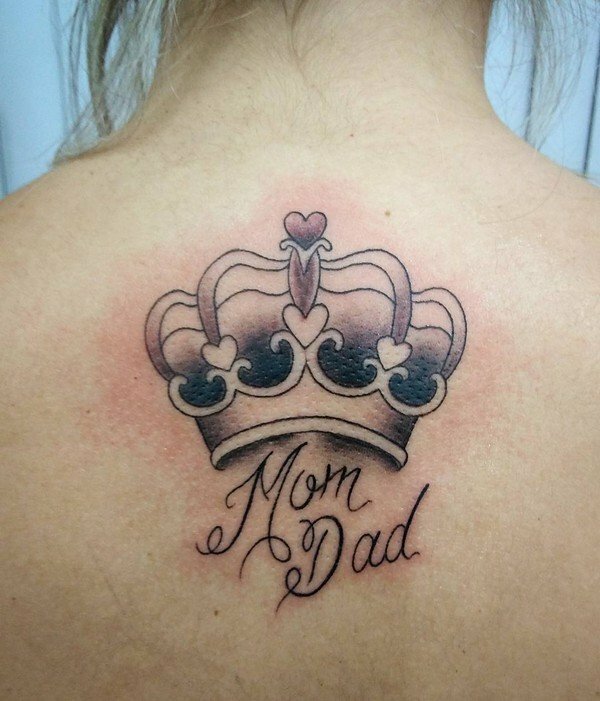 Then, you should get crown tattoos. Wearing the Crown of King George XII will make you feel more confident and invincible. 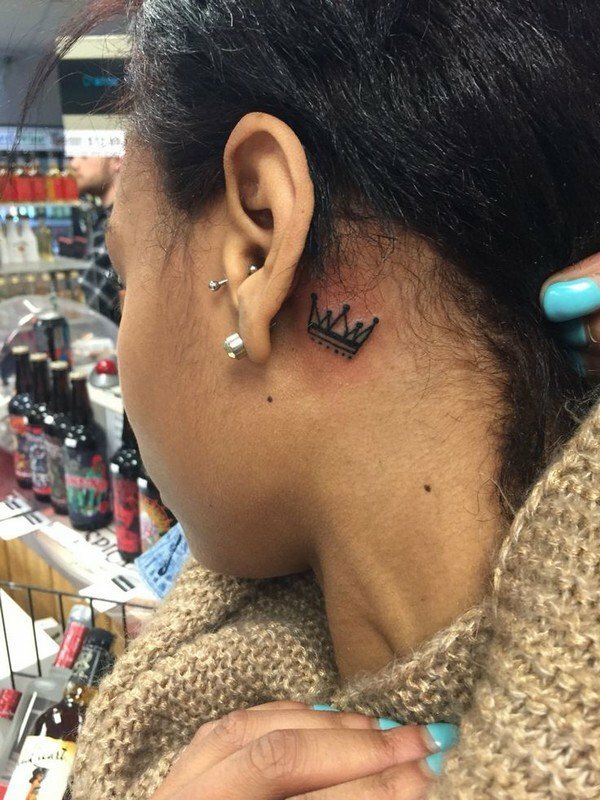 Crown tattoos are suitable for both men and women. 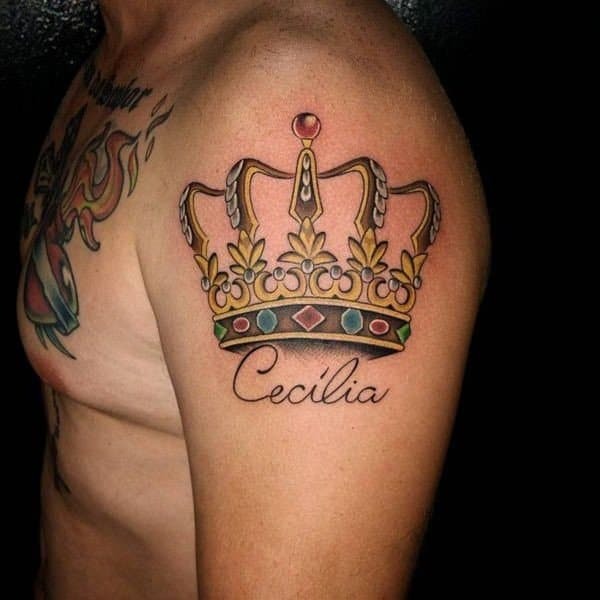 Crown tattoos are commonly associated with royalty. This wearer believes that there is no greater king than God. 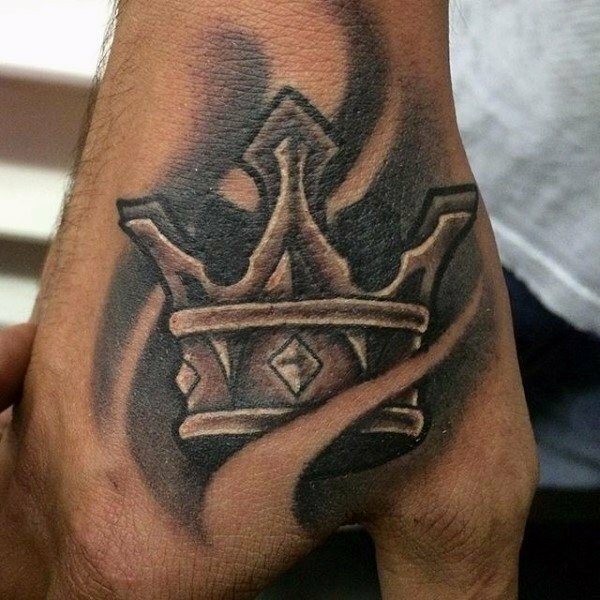 This gorgeous crown tattoo is meticulously done in black and gray. The 5 point crown tattoo represents adventure and enthusiasm. 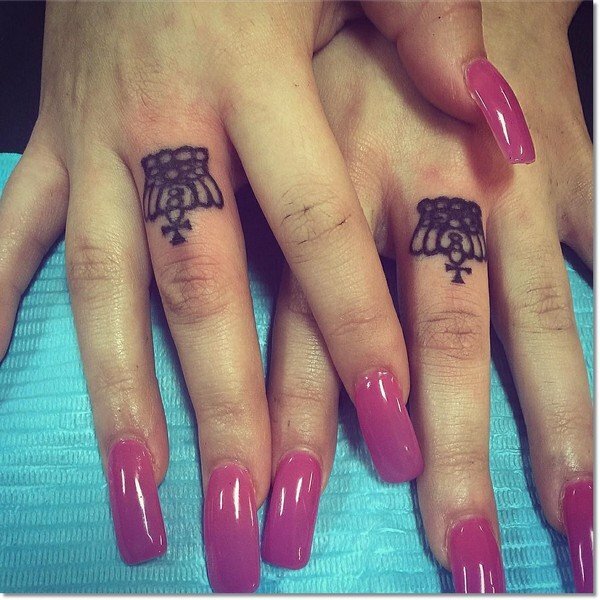 Most couples are big fans of this tattoo. Crowns represent royalty and grandeur while for couples they are the emblem of undying love and faithfulness. 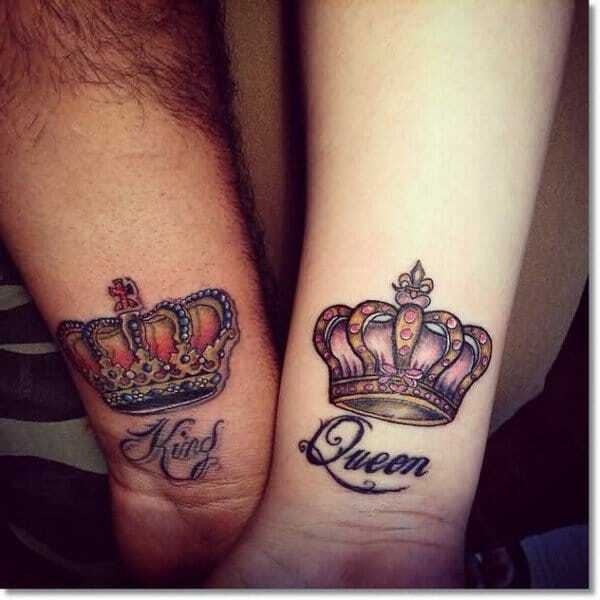 King and queen crown tattoos are inspiring and motivational. 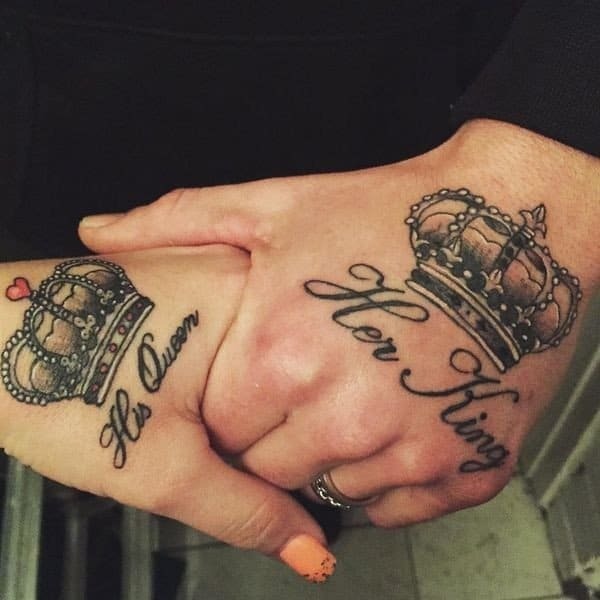 Couples usually place their crown tattoos in highly visible areas. 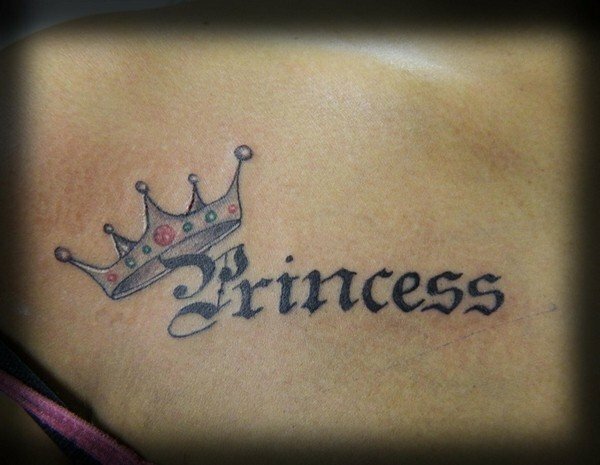 If you are one of those women who want to rule your world, then a princess crown tattoo is an excellent choice. 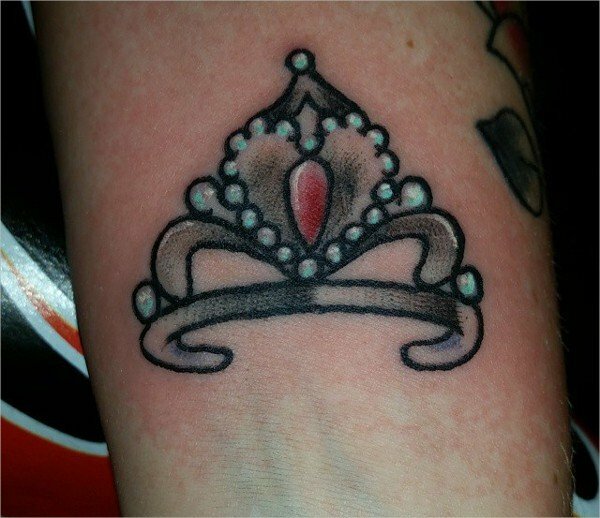 This princess crown tattoo is the best crown tattoo for women. 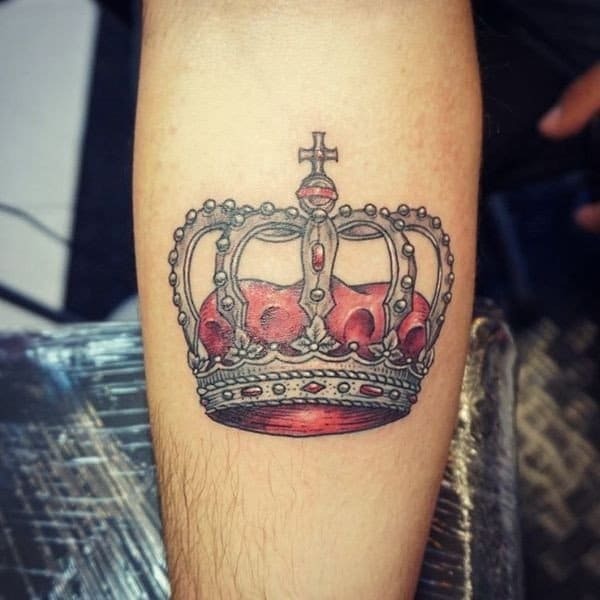 Crown tattoos have a large number of variations. 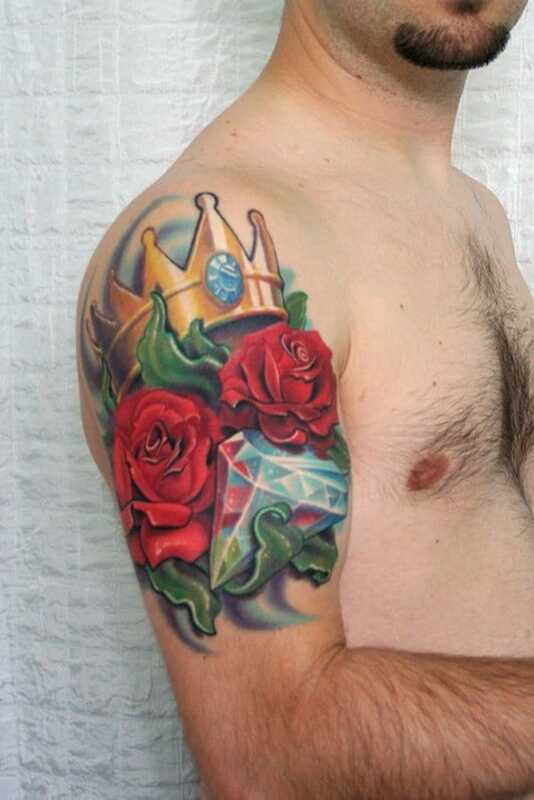 A princess crown tattoo is composed of a metal headgear decorated with precious gemstones. 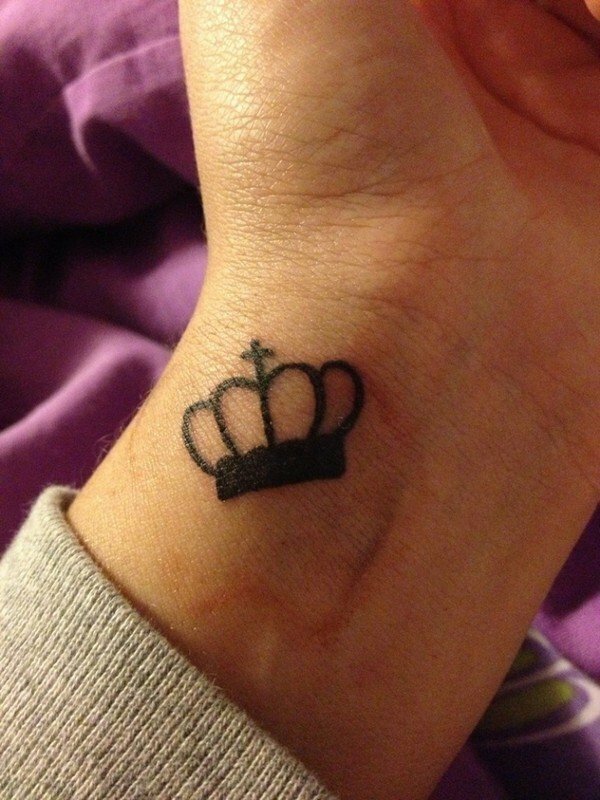 This is a good example of a larger crown tattoo. A vivid and colorful emblem of love, affluence, and royalty. The large crown is combined with a shimmering diamond and red roses. The crown was done in a simple manner. This tattoo looks so realistic! 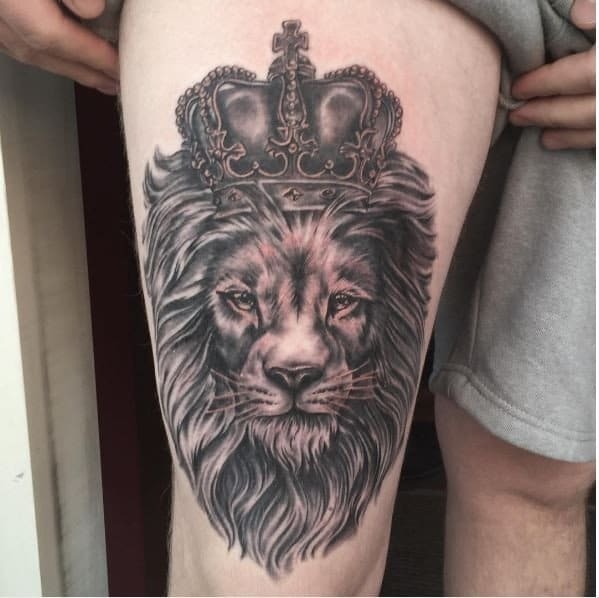 Crown tattoos are often combined with lion to represent the Leo Zodiac sign. A lion is considered as the king of the jungle. This fierce creature is an emblem of strength, power, and loyalty. Some girls want to keep it simple. 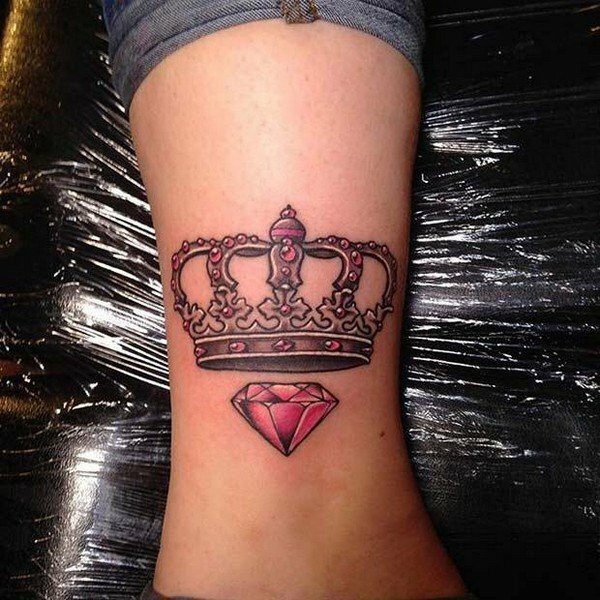 If you want to make a statement then opt for a crown tattoo with a diamond. 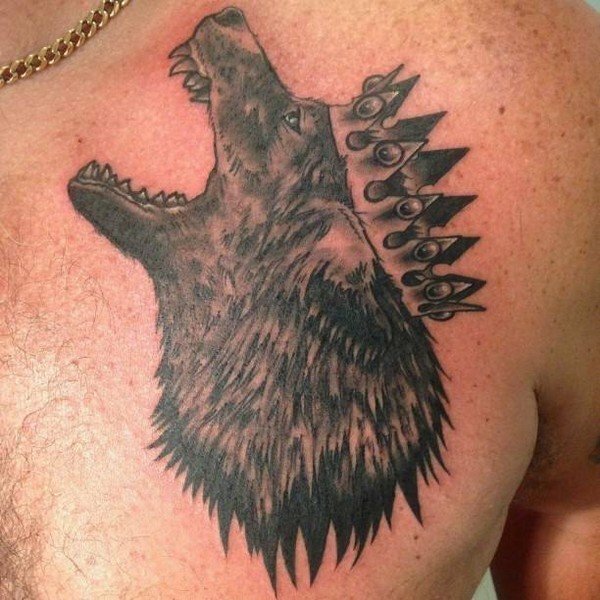 Wolf tattoos are mostly chosen by strong individuals. 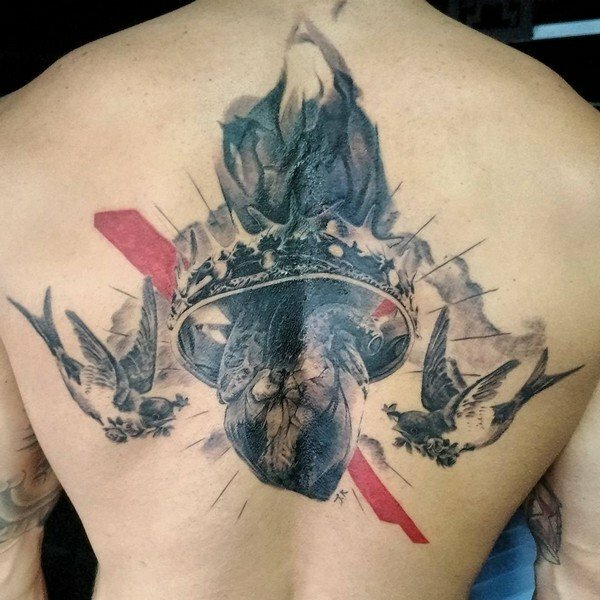 This heart with crown tattoo serves as a cover, and whatever it covers it looks amazing. Our dads will always be our kings and this is the perfect representation of it. This tattoo is often chosen by women who are a bit religious. You can add different types of embellishments to your crown tattoo. Looks better than having a diamond. Does her prince have a matching crown tattoo? It is simple yet delicate, a royal gem for everyone. 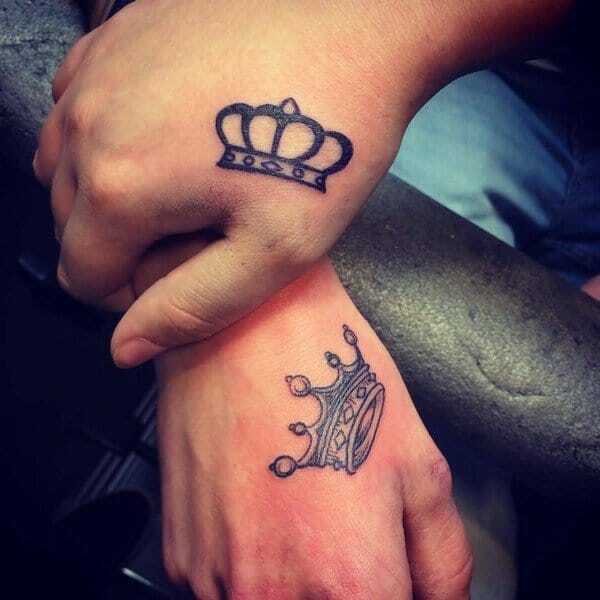 What could be more sweet and perfect than having these crown tattoos? 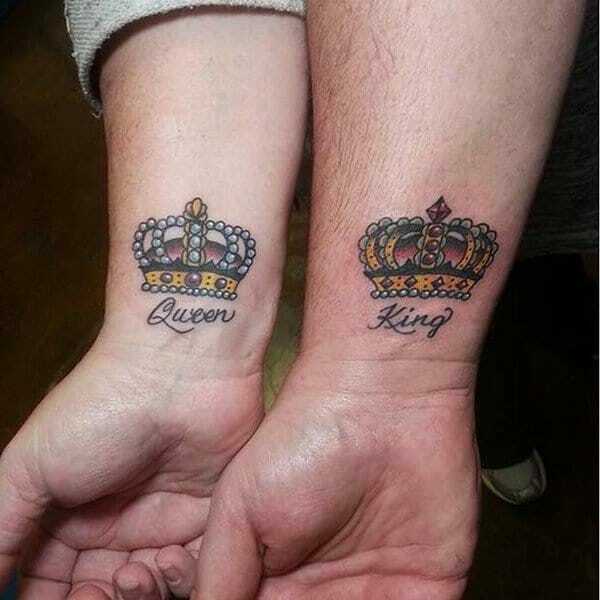 The guy is wearing a queen crown tattoo while the lady is wearing a king crown tattoo. 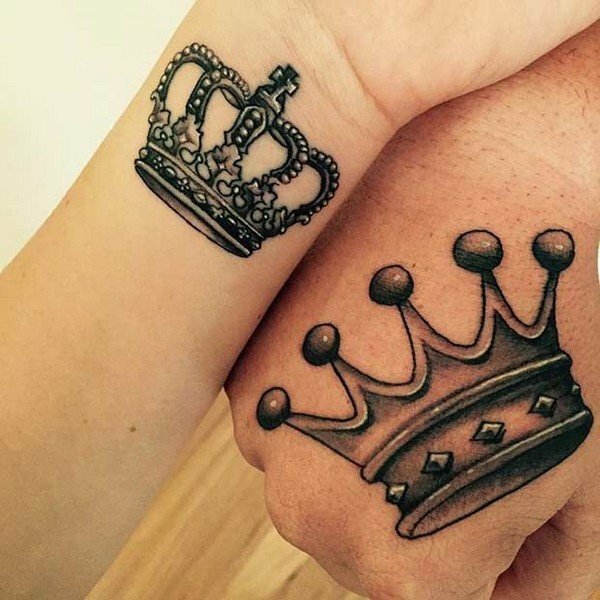 Crown tattoos are precious, that’s why they are perfect for couples. 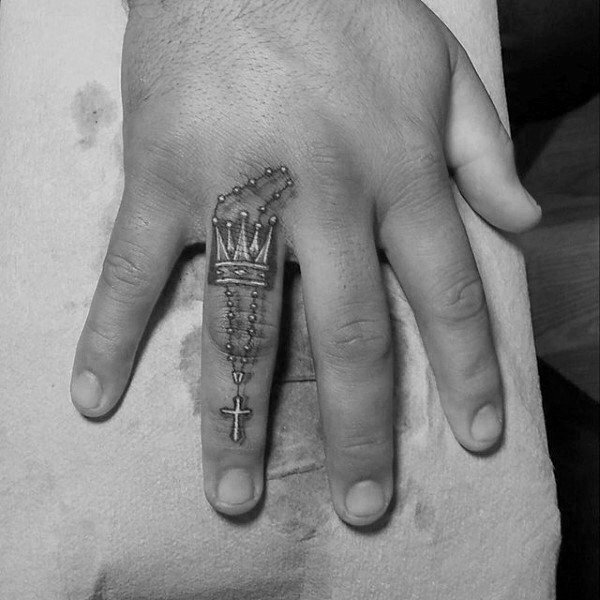 When a rosary tattoo is placed on the ring finger, it signifies that you are committed to your faith. 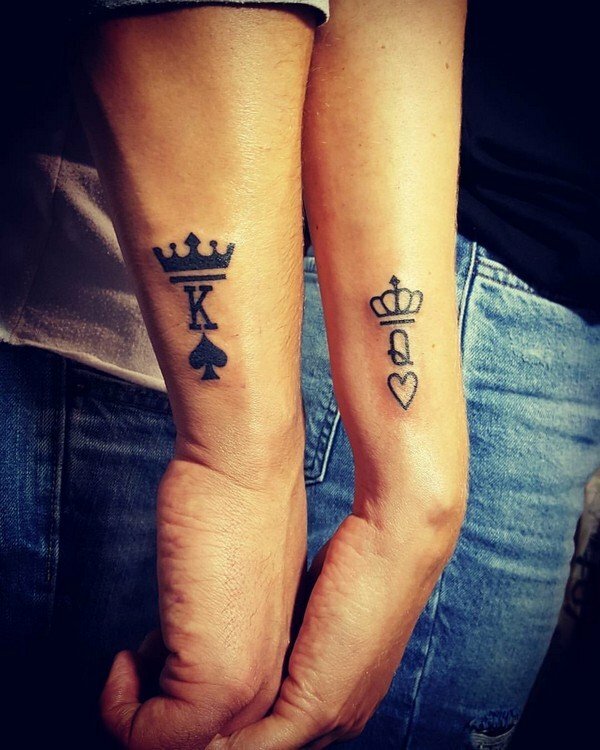 Lovers tend to express their love for each other by wearing crown tattoos. 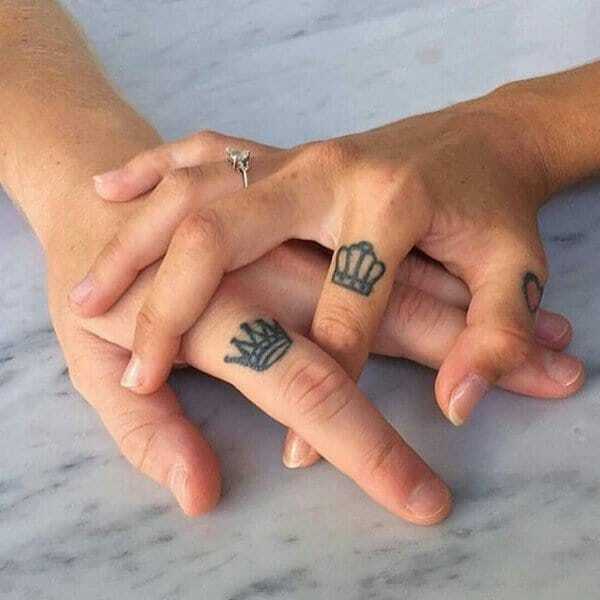 These tattoos express their confirmation of true love. 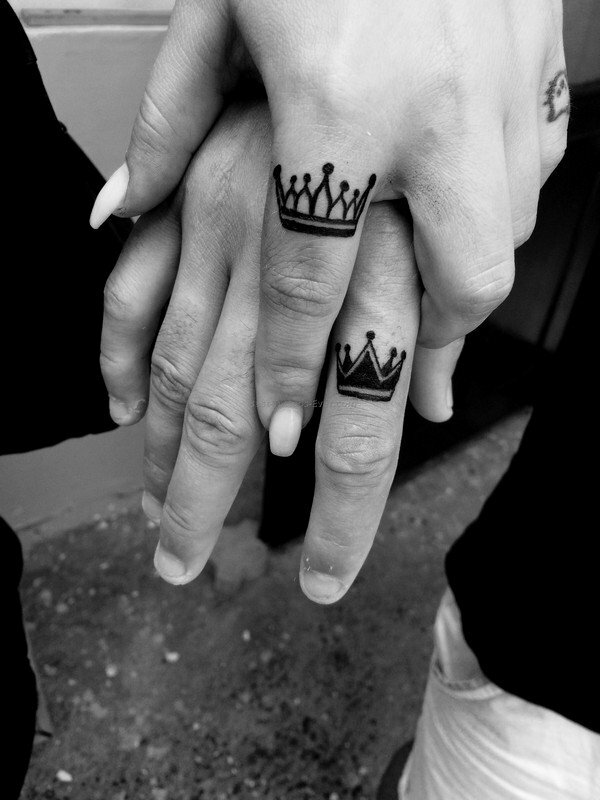 Crown tattoos are a nice adornment on your fingers. 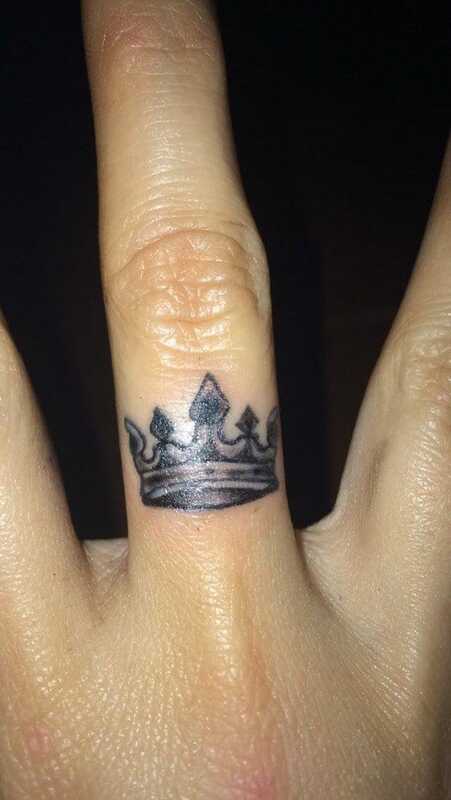 Get a crown finger tattoo now and step out in style. 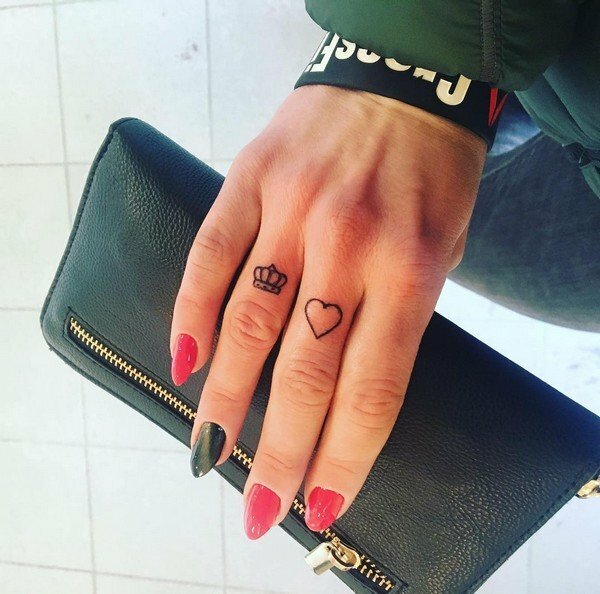 If you’ve been thinking of getting a tiny tattoo, then a delicate crown finger tattoo could be just for you. 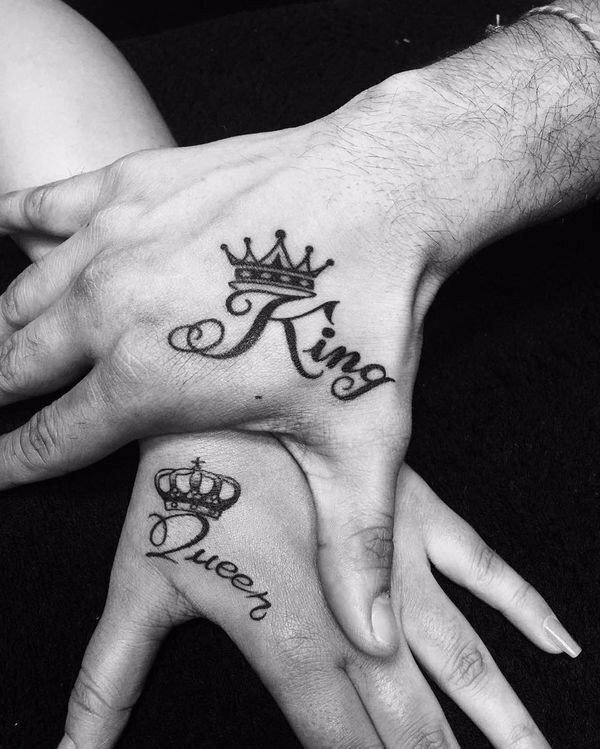 These matching crown tattoos with inscriptions depict an unbreakable bond between these lovers. 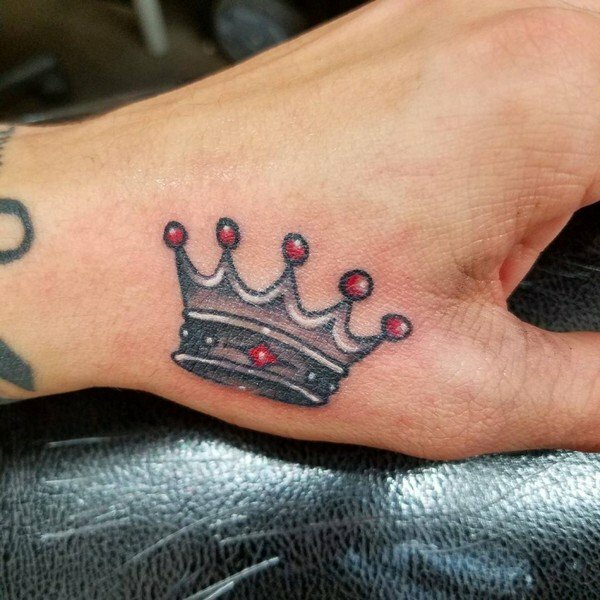 This crown tattoo design fits perfectly on top of the wearer’s hand. 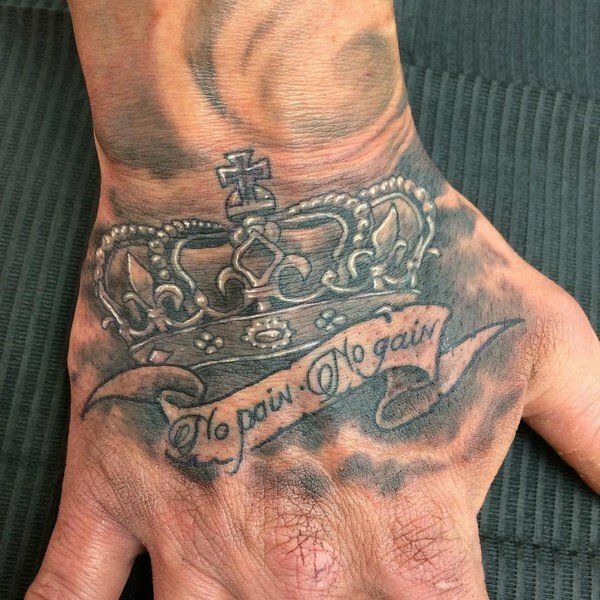 Crowns hand tattoos serve as a confidence booster, especially during those days when you are feeling down. Is this design a bit scary? What do you think? No pain no gain is one of best fitness motivational quotes. In ancient times, crowns are considered as a sign of divinity. 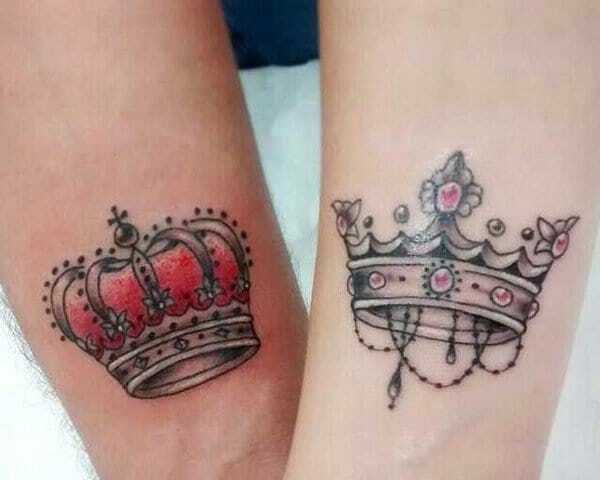 When you are in love, the best way of showing your devotion to each other is by getting crown tattoos together. Show the world that no matter what happens in this life, you will remain stronger. Generally, crown tattoos signify the desire for power. 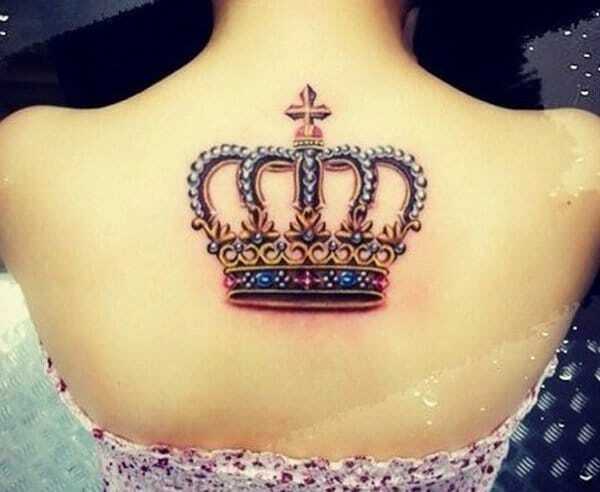 Crown tattoos are commonly chosen by confident and strong-willed persons. 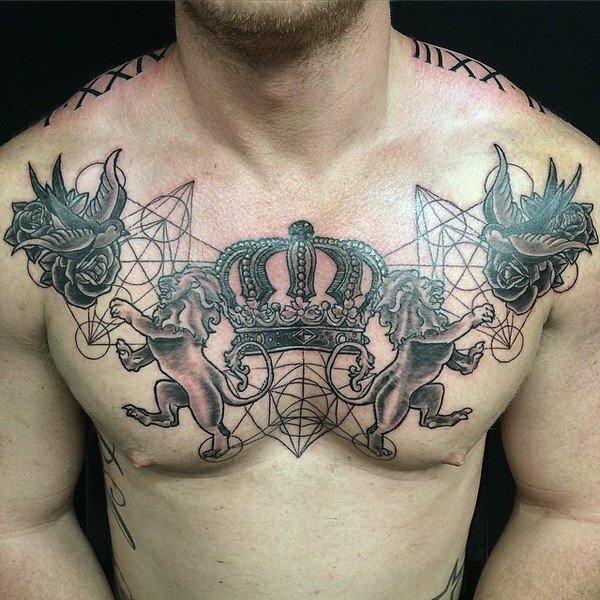 This massive crown tattoo symbolizes endurance, leadership, honesty, and superior intuition. 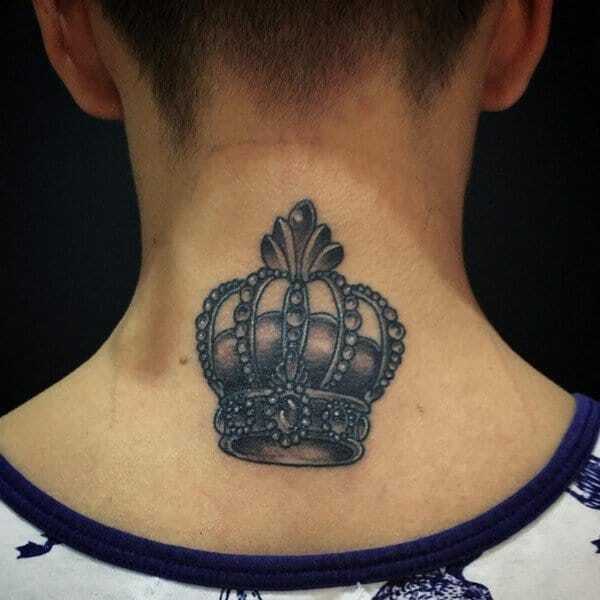 This golden crown tattoo is spread all over the chest of the wearer. It incorporates two red roses and sharp-tipped white wings. 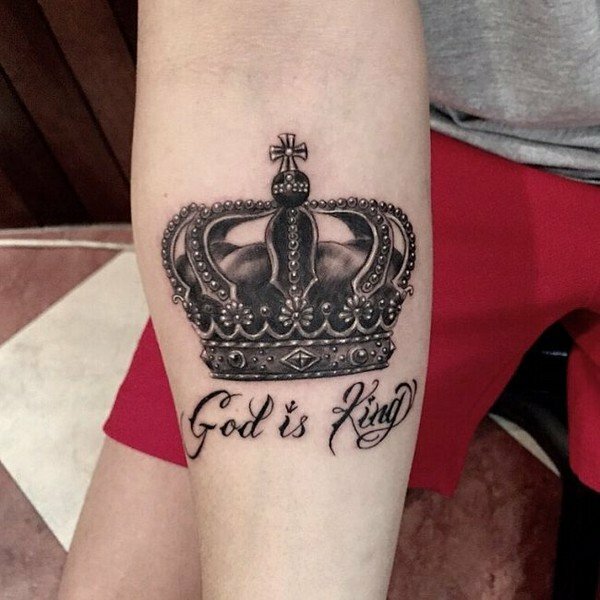 This crown tattoo has a religious meaning since it includes a crucifix. It seems that the crown has light rays, which signifies that it is a symbol of hope. 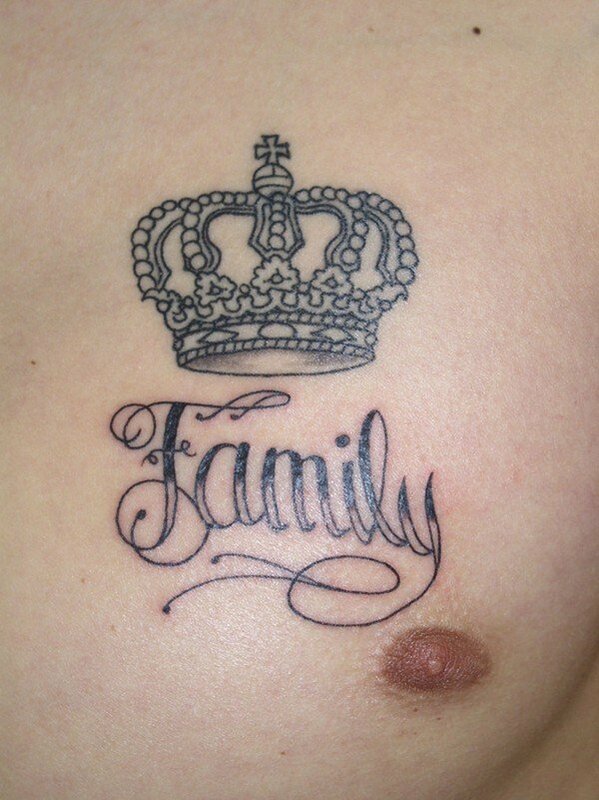 Crown tattoos can be combined with a lettering. You can choose to put your name, the name of your loved ones, or perhaps a famous quote. Perhaps this tattoo is associated with love since it includes a heart. It depicts that love can conquer all. 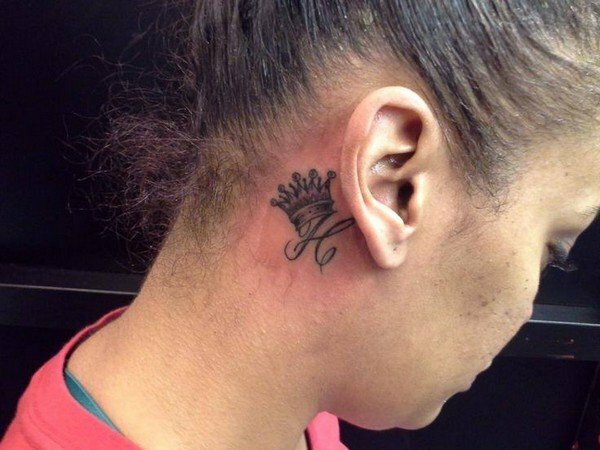 Generally, crown tattoos are very symbolic. It can mean different things to different people. 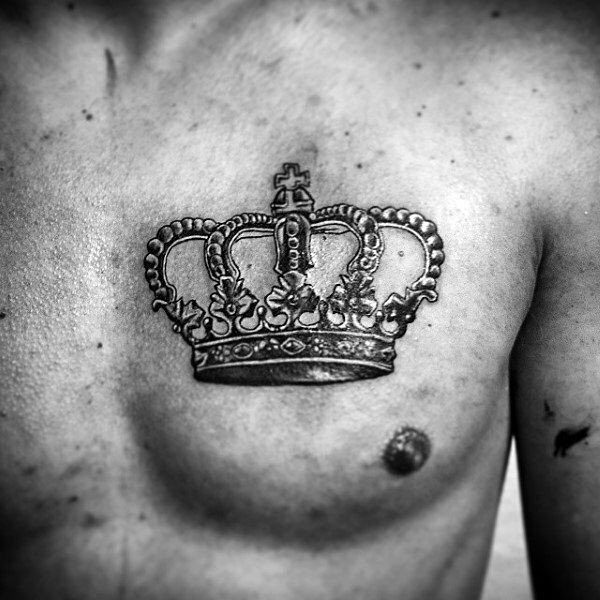 In August 2012, Justin inked a small crown on his chest. A lot of people believed that it was a tribute to the late Michael Jackson. The crown is hidden behind the ear. 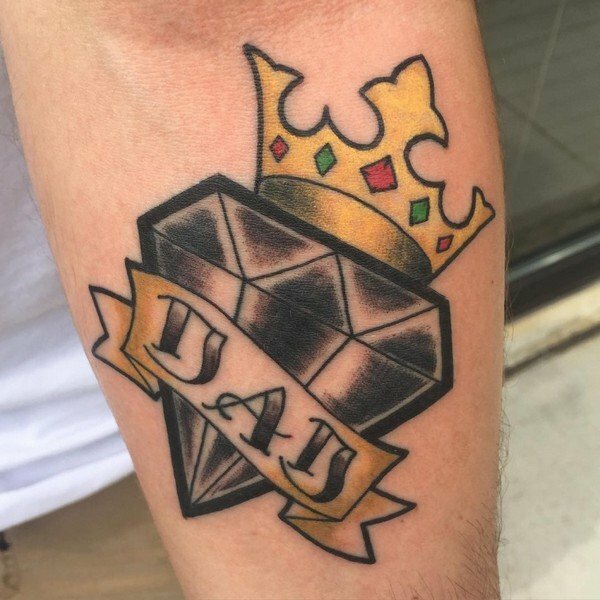 This tattoo has a unique placement and an interesting design. Regardless if it does not have gems and colors, it still stands out! 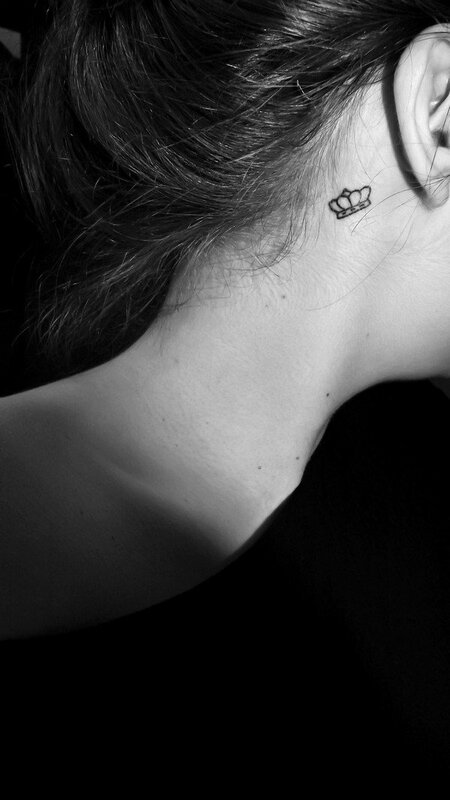 This diminutive black-inked crown tattoo is done in a minimalistic style. If you want to make a statement, but do not want to make too much impact, then behind the ear tattoo is the best choice. Placing a tattoo behind the ear does not only look awesome and magnificent, yet it gives you the chance to show off your fabulous body art while still remaining discreet. Do you have someone special in your life? Perhaps, it’s your partner in life, best friend, or family member. 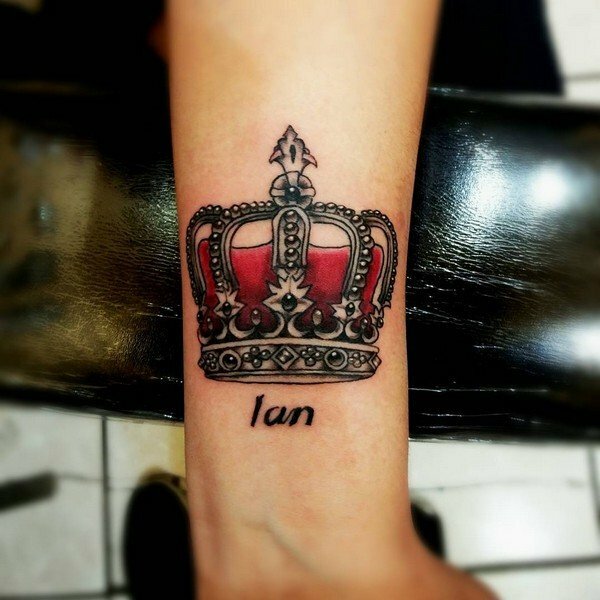 If so, then you should consider having crown tattoos with initial. Do you want to feel like a Queen for the rest of your life? 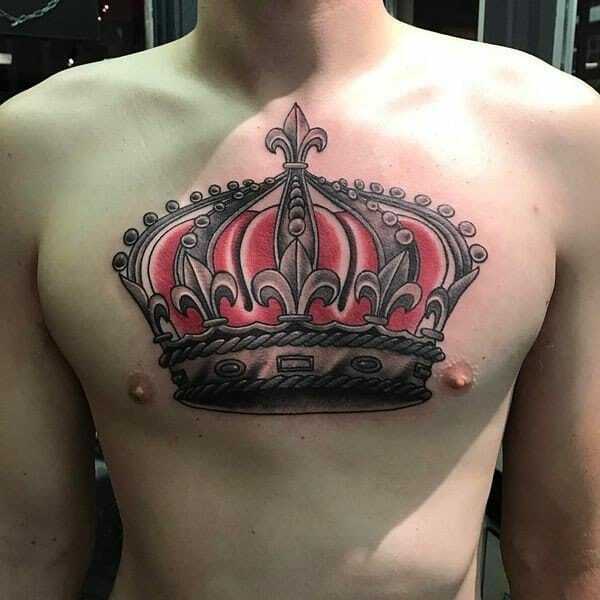 If so, then you should get crown tattoos. 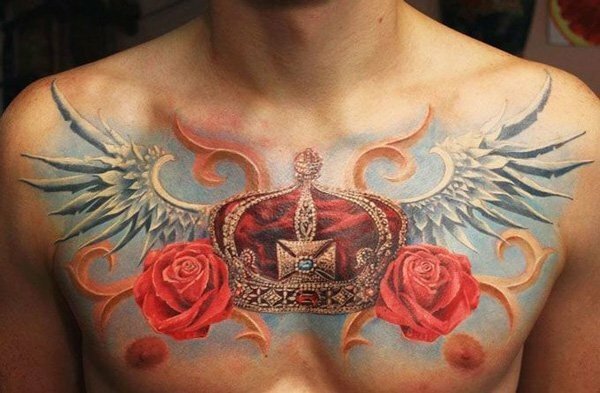 This stunning body art can make you feel like a royalty. When it comes to finding the best behind the ear tattoo, the choices are endless. 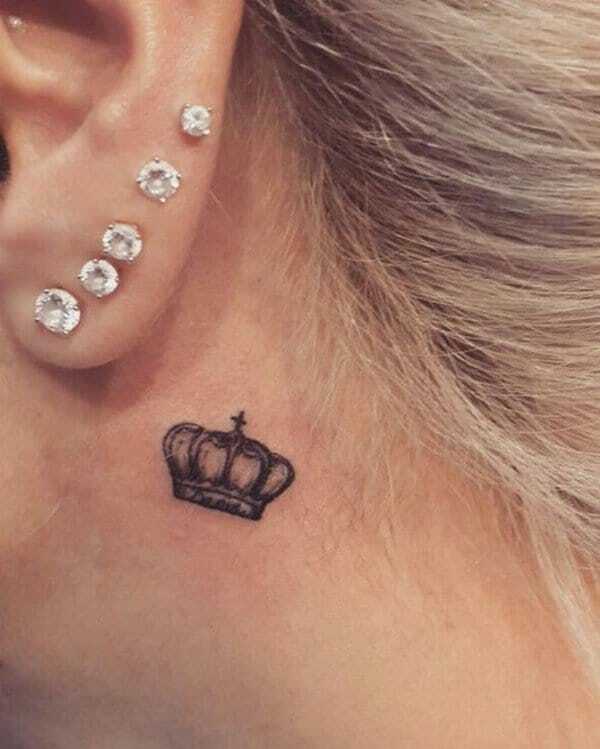 Crown tattoos can either be massive, covering the whole back area, or small, just a mark behind the ear. 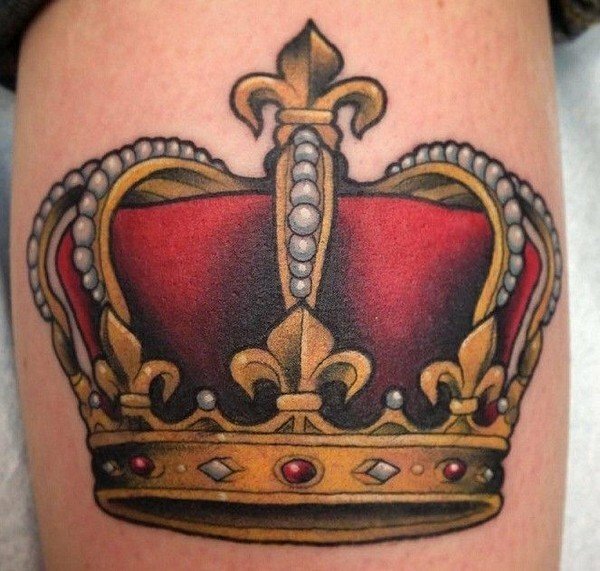 Crown tattoos can bear a lot of meanings, however, the most obvious meaning is royalty. 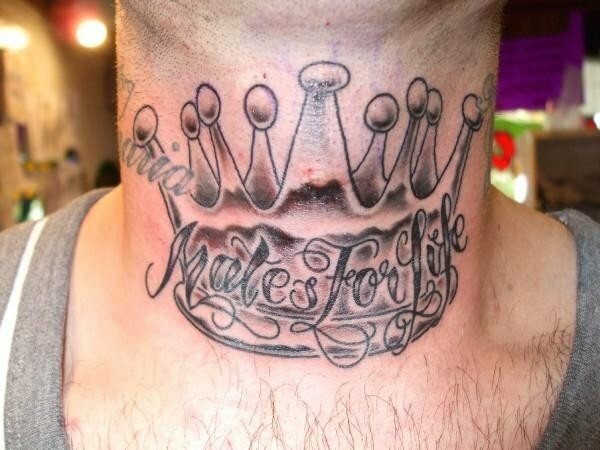 This tattoo most likely represents the wearer’s commitment to his mate. 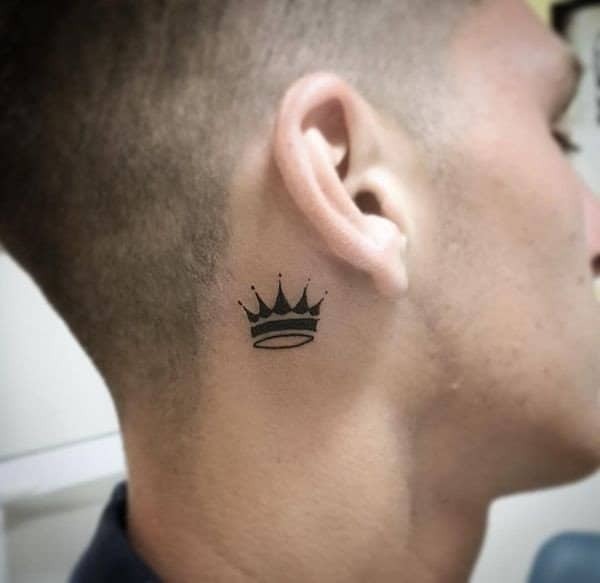 Crown tattoos show that you are in charge of your own life. 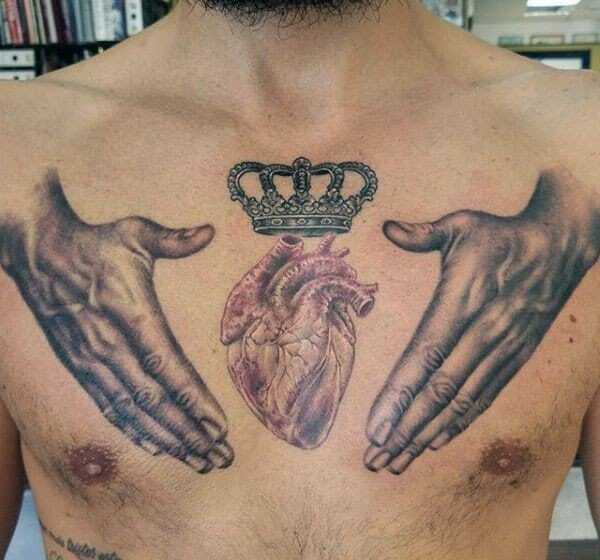 This tattoo idea has an interesting style. 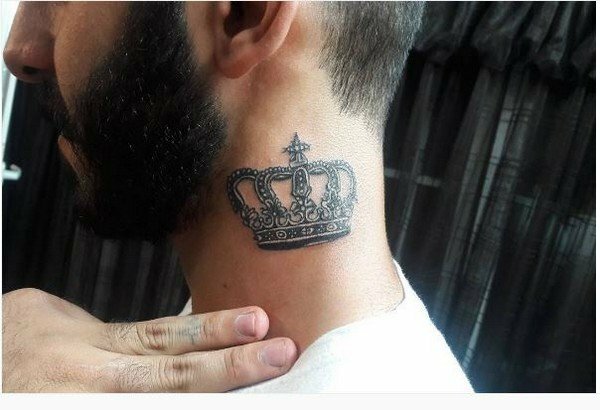 A number of men are getting crown tattoos because they can look really cool and innovative with it. Crown tattoos are versatile. In fact, you can ink them alone or combined with other elements. In choosing a particular crown design, just let your imagination run wild. 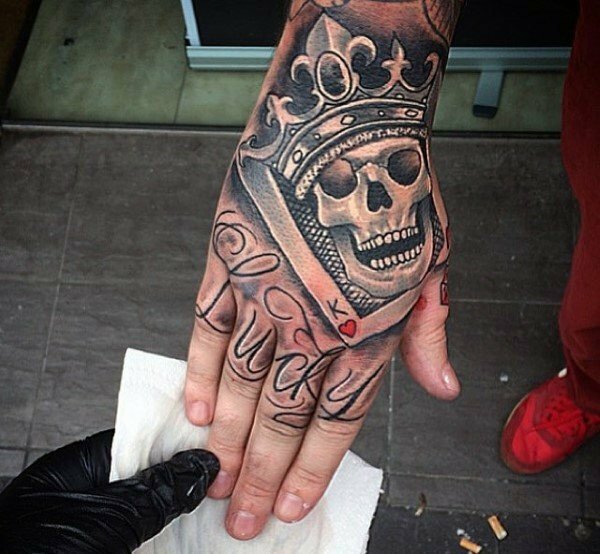 This crown and skull tattoo signifies good luck. These types of tattoos are perfect for gamblers. 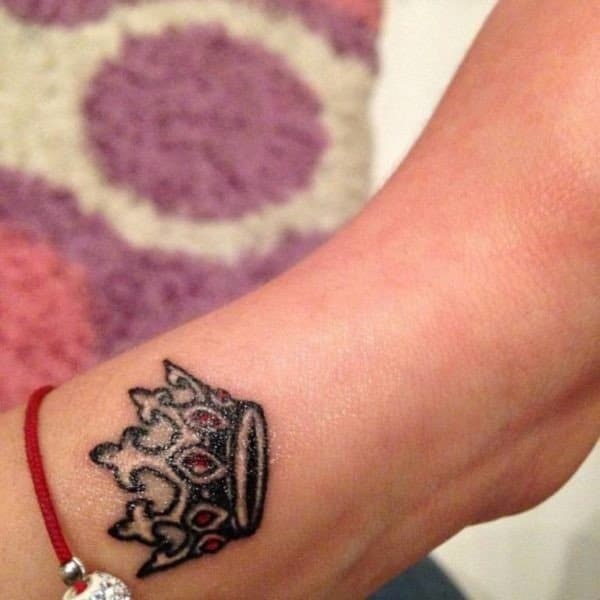 A feminine and intricate crown tattoo. The ribbon flows gently through the crown tattoo. 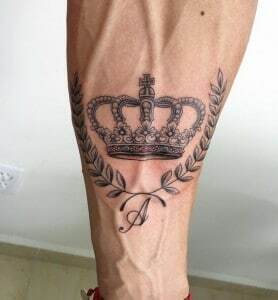 If you have a domineering nature, then you should get yourself inked with this impressive crown tattoo. 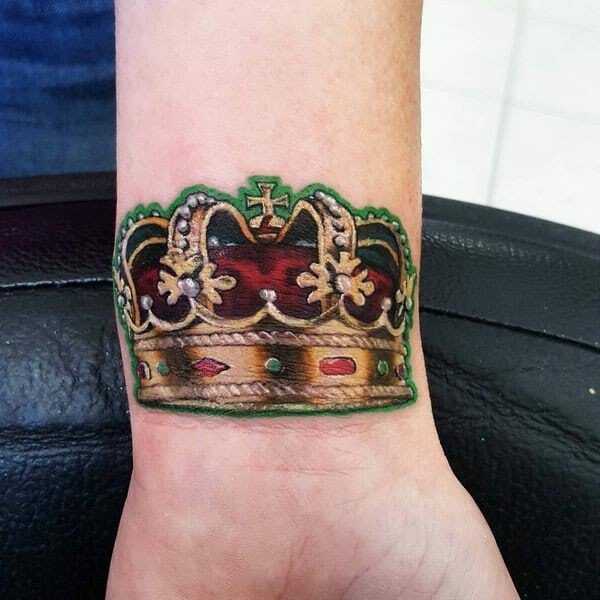 Crown tattoos are perfect if you feel that you are the ruler of your life. The best way to experiment with a tattoo is to start with a small design. 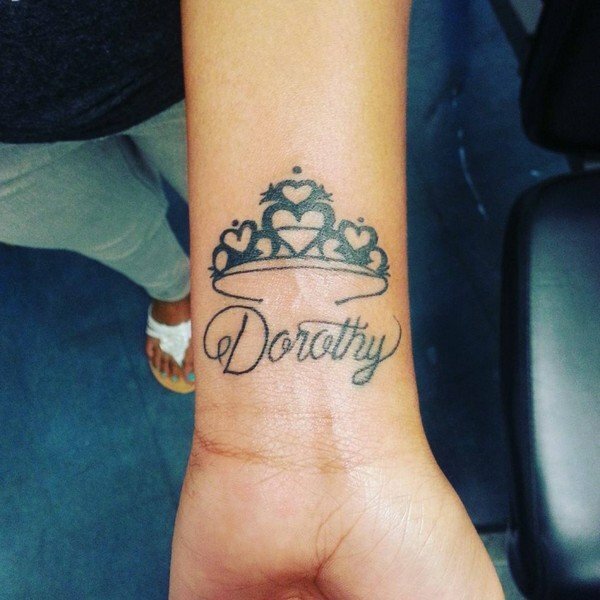 Frequently, small tattoos are inked on ankles, neck, and wrists. The crowns of the English monarchy are perhaps the most popular and commonly imitated due to their level of detail. During the early days, tattoos are only done in black ink. These days, you can choose any color that you want. These tattoos are a good example of how stunning colorful tattoos are. They have a beautiful shading and a cartoon effect, making them look playful. 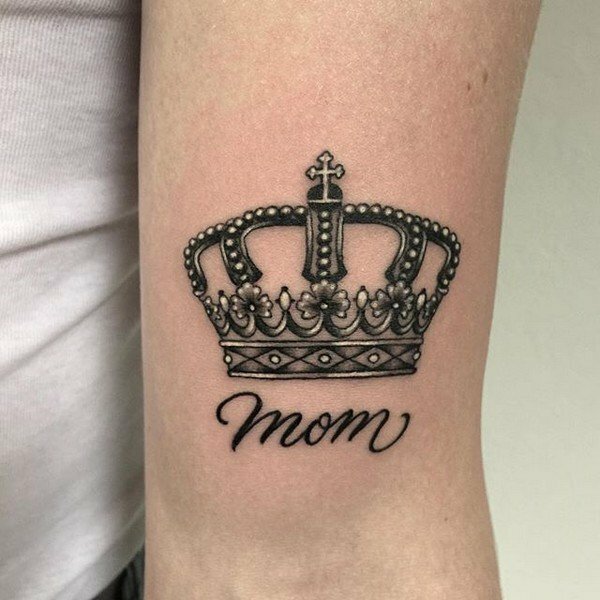 If you want to get a crown tattoo, then search thoroughly for the most amazing design. Before making a decision, you should think about it meticulously. Keep in mind that your design must incorporate with your individuality. 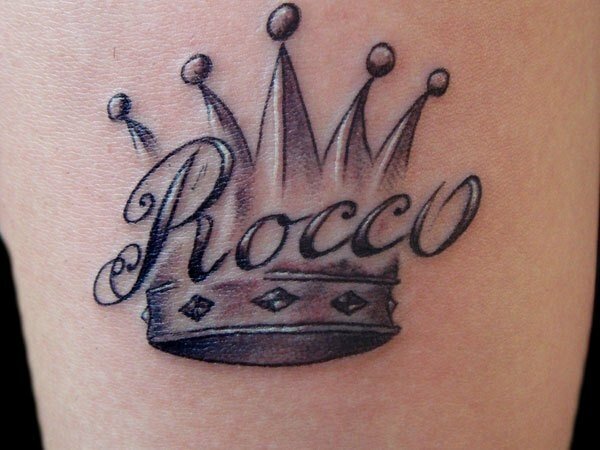 Crown tattoos can be done in a simple way or in an intricate way by adding some embellishments. Some designs are styled in such a way that it can look more feminine or masculine. 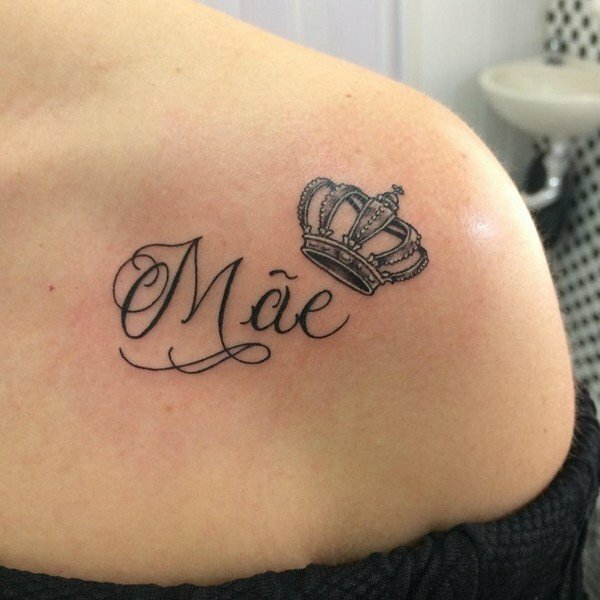 Feminine crown tattoo designs are very popular. Most girls want to feel and look like a princess. 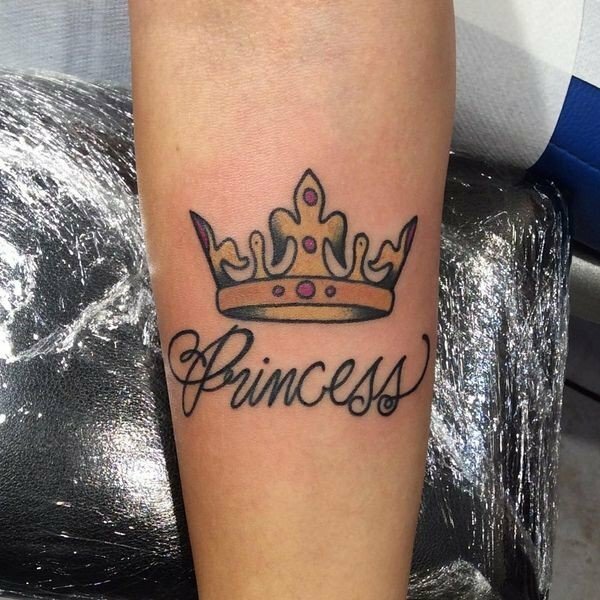 Princess crown tattoos are usually done in pink color. 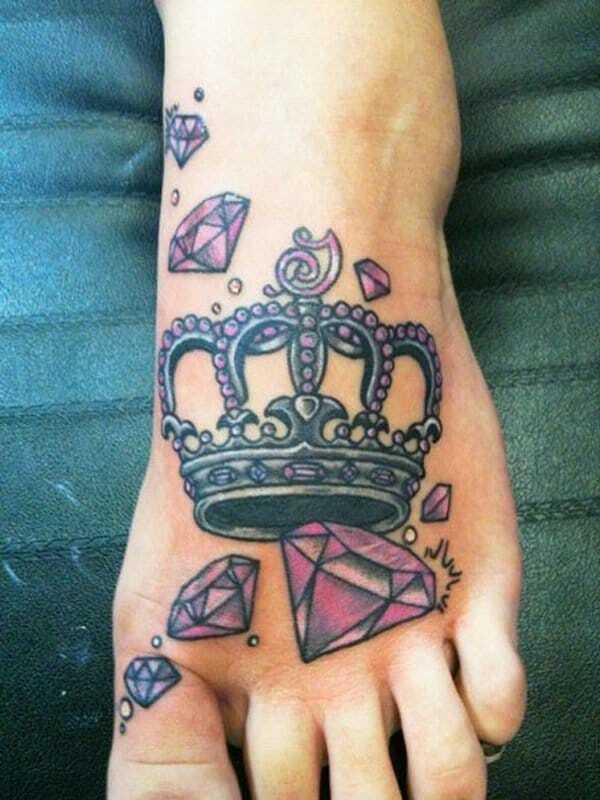 Women also want to get a crown tattoo with gems, diamonds, and sparkles. 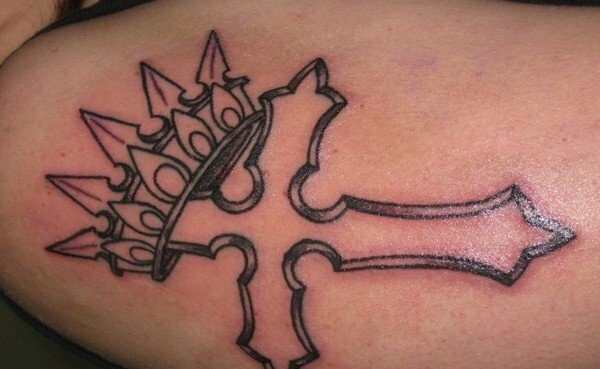 Crown tattoos can be illustrated in a lot of ways. It can be combined with diamonds, crystals, jewels, and other objects. 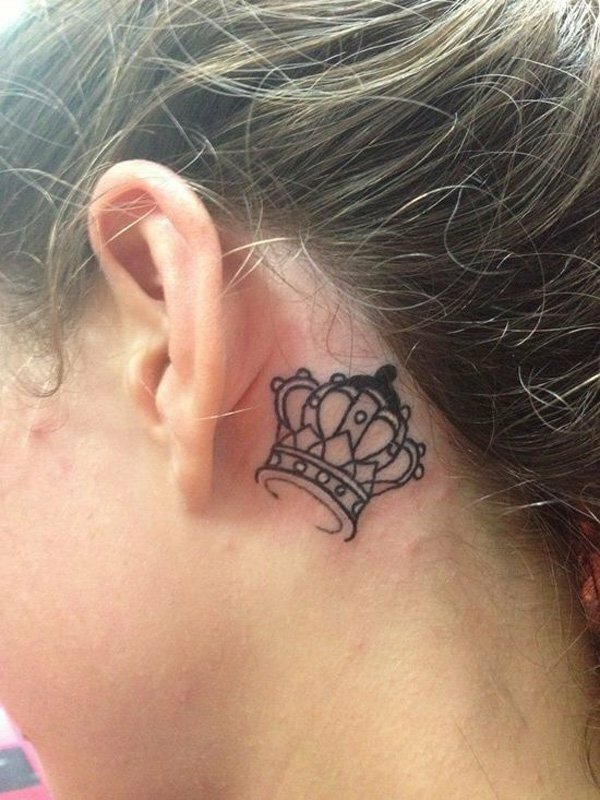 Small crown tattoos can be placed on the back of neck, wrists, ankles, finger, foot, or behind the ear. 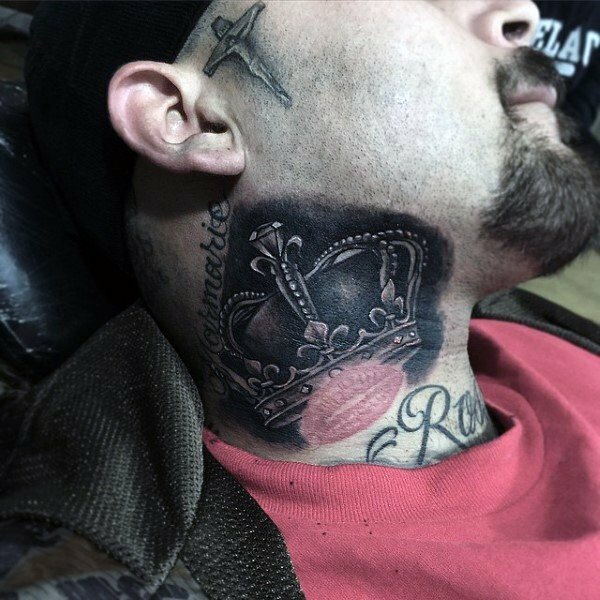 Sometimes, crown tattoos are done on a pair. 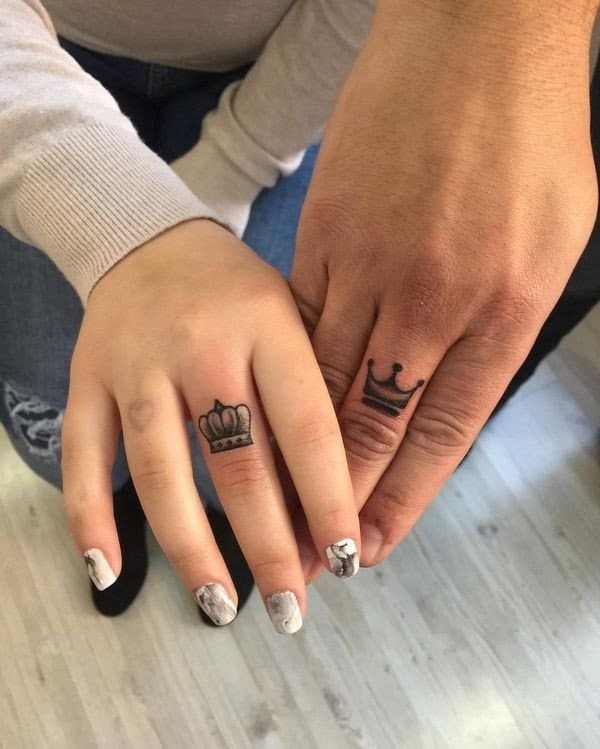 Couples can design their own matching crown tattoos. 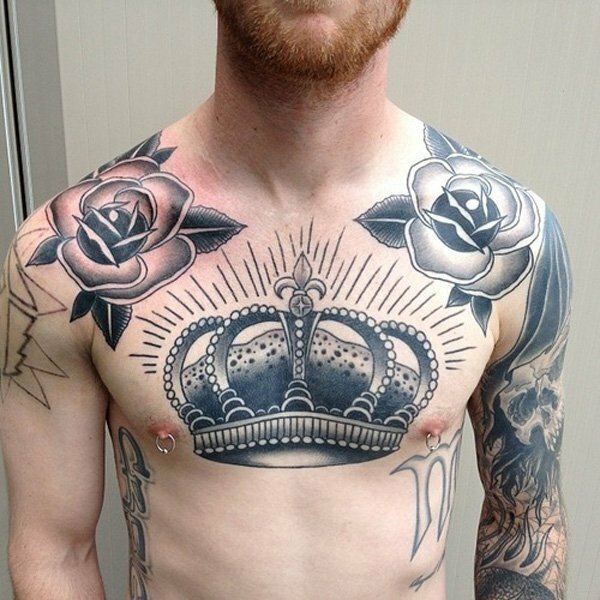 A larger crown tattoo can be placed on the chest, shoulder, arm, leg, thigh, and other spacious parts of the body. 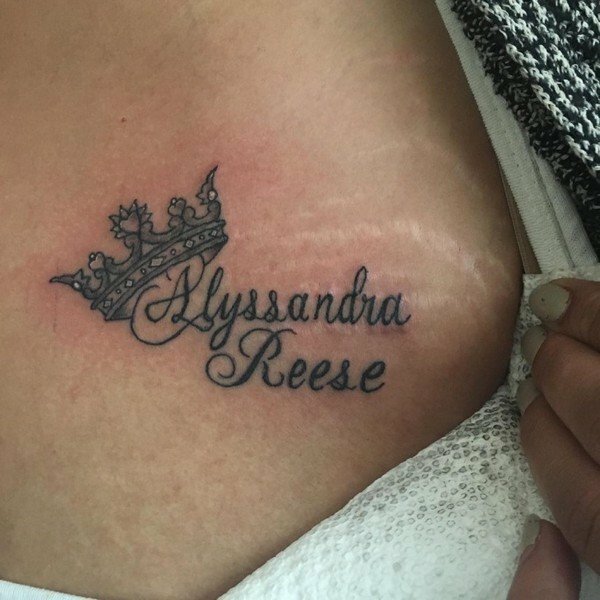 More and more women are now getting crown tattoos ever since popular blogger Constance Hall started the trend on social media.